Is the bounty hunter’s target really an innocent woman? Convinced her sheriff brother-in-law murdered her sister, Jamie Carter hides her six-year-old niece away until she can prove his crimes. Bounty hunter Zack Owen is bound by the law to turn her in, but Jamie’s story sways him to protect her instead. On the run together, Zack must face the personal price of falling for his fugitive. 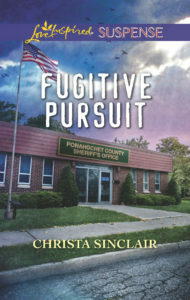 Fugitive Pursuit is my 1st Love Inspired Suspense. The ebook released on May 1st and the paperback released on May 8th. Get your copy today! Anger for the way she’d left him at the café should have been visible through his expression, but he studied her with calm determination. He was bigger than she’d first thought the other day, wider in the chest. Stronger, probably. Intimidating, definitely. Yet she didn’t fear for her life. One man trying to finish her off and one trying to bring her in. Great. As if her life wasn’t complicated enough.